Exporting your Product List from Vend – How can we help? How do I export my product list? To export your store's product list, navigate to the 'Products' tab in the sidebar. You'll notice the product list below has now changed based on the filters you've applied. 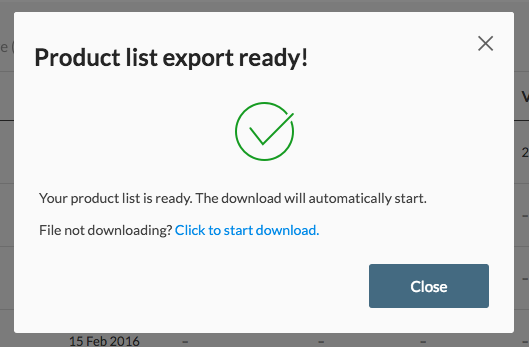 Once you are ready to download, your products click the button labelled 'Export List' to the right of the screen. Your download will begin automatically, and a progress bar will appear on the screen. Once this is complete, you will be prompted to save the export as a CSV which you can then open in a chosen spreadsheet application such as Excel or Open Office.